Taste Tester and I travel a lot. I also, however, like to cook – a lot. This presents somewhat of an adjustment issue for our fridge. I generally like to keep a stocked fridge so that meals can be whipped up to satisfy any random evil hunger pangs. But when a trip is around the corner, I often look to use up whatever we have and avoid buying new things so that we don’t end up throwing a bunch of produce out before we leave. Or, conversely so that we don’t return home to a science project in our vegetable drawer. We are heading to Texas on Saturday and as usual prior to a trip, our fridge is looking a bit sparse. What’s a hungry girl to do? Luckily one of my favorite foods comes in particularly handy in this kind of situation. We always have plenty of peanut butter around and it’s a good source of protein when we are lacking a variety of nutritional foods in the house. I suppose there’s always that can of beets in the back of the cupboard but what do I do with that? Why did I even buy those? 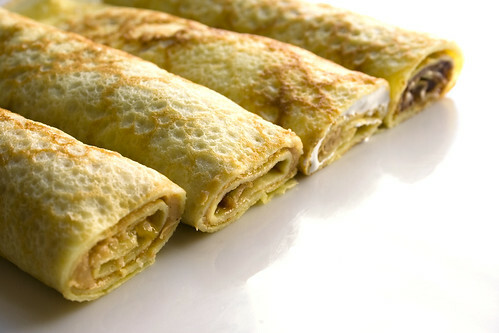 Anyway, Everyday Food recently published a spread of crepe recipes and I knew I was in business. Eggs? Check. Flour? Check. Milk? Check. The batter recipe is made up of the most basic kitchen ingredients and you can fill them with anything you like. 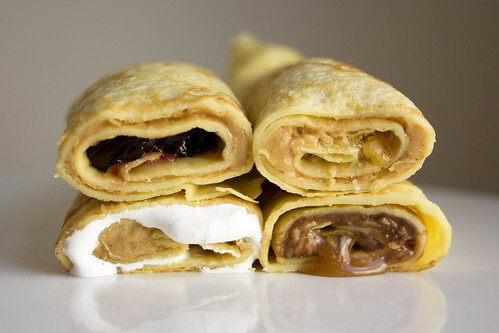 So, say hello to a lovely array of peanut butter crepes. I’d never actually made crepes before and was shocked at how easy they are. Considering my lack of experience, I’m not sure how typical or atypical this recipe is but you literally throw all of the ingredients in a blender, wait 15 minutes for it to rest or ponder the meaning of life, or whatever it does and then cook the batter in a buttered pan. Easy peasy for even the sleepiest of sleepy-heads. And you can even store some of the batter for subsequent breakfasts (or prepare it for dinners with savory fillings) later in the week. You can get the crepe batter recipe from Everyday Food. 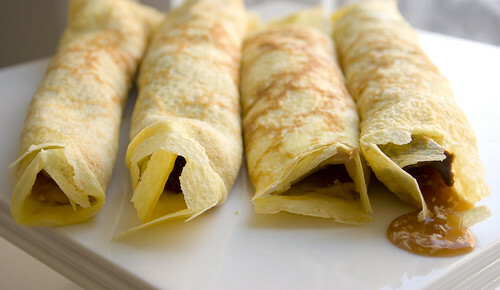 We were pretty generous with the fillings, using about 2 Tbsp of peanut butter in each, 1 1/2 Tbsp jam or caramel and generous sprinkles of coconut (swirling it into the spreads before rolling the crepes). While I’m in Texas being peer-pressured by our cousin into eating things like gator and crawfish, I’ll be thinking fondly of the simpler things like these crepes. Unless I really take to the local cuisine, in which case maybe I’ll start a sister blog called “Gator and Crawfish: Heck Yes!”. See you there? Wow, could you pick a favorite?